I went to a lecture a few years ago where Ursula LeGuin, who doesn't flinch from speaking her mind, ripped into Wallace Stegner with vigor and elan. He had plagiarized Angle of Repose, she said, from the letters and memoirs of Mary Hallock Foote, a popular artist and novelist from the late nineteeth into the early twentieth centuries. It turns out that there’s quite a bit more to be said about that, but the accusation cast a modest shadow over the reading. Also, I forgot it was on the Reading List, listened to it on audiobook, and then felt like I should really eye-read it for Reading List purposes. Working my way through it twice in sixth months was perhaps a bit much. In the late 1800s, a woman who is passionate about the arts and intellectual life marries a mining engineer, and consequently must endure life in the mining districts of the Mountain West. Her dedication to her ideals gives her great strength, and also makes her extremely vulnerable. Stegner relates her story from within a first-person framing story that connects it thematically with social issues of the early-1970s present in which the book was written. 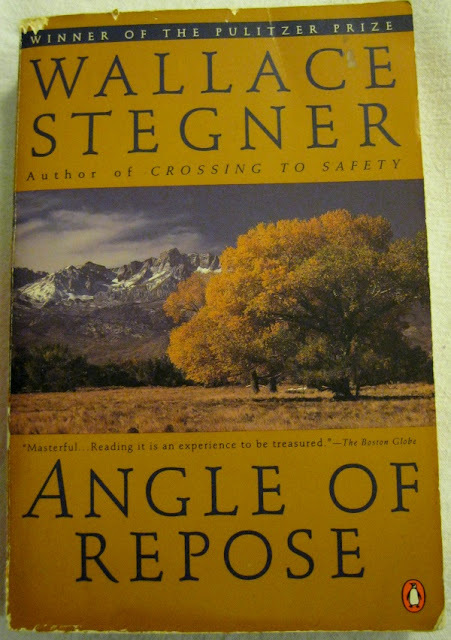 What Stegner does best in Angle of Repose is invoke a picture of the American frontier that is delightfully free of conventional “Western” hokum. The fake West that everyone knows, erected by Hollywood on a foundation of pulp novels, is an isolated, almost hermetic place where everyone is a rugged individual, male of course, a restless straight-talker who has come out West to get away from the trappings of civilization. Now, there might have been some grain of truth to this nation-of-misfits mythology during the time of the fur trappers, perhaps. Maybe. But certainly, by the time of covered wagons and let alone by the time of locomotives, the West was being colonized by folks who were, most of ‘em, more or less able to function in the context of a community. Stegner, who was immersed to the gills in Foote’s papers while he was writing, gives it to us straight. He shows, rightly, a West that is integrated hand-in-glove with the East, desperately reliant on Eastern markets, Eastern training and educational institutions, Eastern manufactured goods, and especially, especially, Eastern (and British and German) capital. Social connections, then as now, were maintained across the continent through writing and visits. And individuals were no more ruggedluy independent than was the region as a whole. If you weren’t a farmer – and no one is more tied into the global economy than is a farmer – you most likely had a job or a small business; the American West happened about a century too late for real rugged individualism. And although every town has a few people who think they want to get away from it all (Concord, Massachusetts, springs to mind), most people in the West were working hammer and tongs to bring the trappings of civilization out to their new home as soon as possible – preferably at a profit, of course. Angle of Repose gets this all wonderfully right, simply as the context in which its characters live. And interestingly, although Stegner’s novel is pretty much the literary apotheosis of the academic New Western History movement, he actually beat them to the punch by about a decade. Within this finely realized setting, Angle of Repose is a family drama. It’s about marriage, really. It’s about things like commitment and communication and compromise and all of the other elements that make family life joyful when things are going well, and hellish when they’re not. It’s also worth mentioning that it won the Pulitzer and is widely considered one of the best American novels of the 1970s and that, despite this, it sold well. Obviously I wouldn’t have let Mr. Axsom do the gushing if I planned on doing much gushing myself. I can’t really gush about Angle of Repose. I acknowledge that it is skillfully and knowledgeably written with strong characters and psychological verisimilitude. That’s certainly enough to make it a good book! But friends, as good books go, I’m afraid I found Angle of Repose just a bit – shall we say – dull. Not outright boring, mind you; just slower-moving than it ought to have been. It establishes the nature of its characters and their lives, and then marches them through a few too many repetitions of the same patterns. It’s good biography, but not great storytelling, and this is after all a novel. The central event of the book is backloaded so close to the end as to make the whole thing verge on a shaggy dog story, especially on the second reading. Ladies and Gentlemen, I give you Angle of Repose: a very good, deeply flawed novel. Required reading for your History of the American West class, and strongly recommended if you think that cowboys played a critical role in U.S. History. If you’ve just got a hankering for Wallace Stegner, start instead with the equally good but less flawed Crossing to Safety, and see where things go from there. "my antonia" is the only other book i can think of that's similar. how does it compare? Know what? I've never read "My Antonia." My grad school advisor would be appalled.